Nearly in every corner of the globe, someone has managed to find or excavate mysteries skulls that defy explanation. 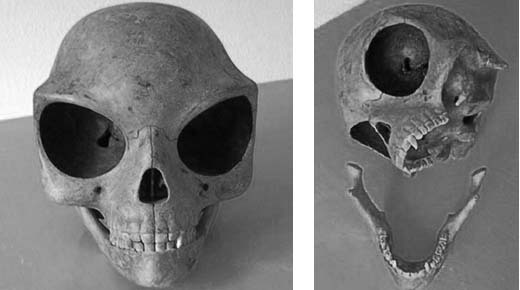 Whether these mysterious skulls are of human origin or not, is an ongoing debate among skeptics, researchers and those who firmly believe that the mysterious skulls, which do not resemble any human species, are in fact of extraterrestrial origin, and as such, can and should be interpreted as the ultimate evidence that proves that our planet has been visited by beings, not from Earth. In the barren landscape of the Peruvian desert, in 1928, archeologist Julio Tello made one of the most mysterious discoveries when he uncovered a complex and sophisticated graveyard under the harsh soil of the Paracas desert. Tello discovered a set of controversial human remains that would forever change how we look at our ancestor and our origins. The bodies in the tombs had some of the largest elongated skulls ever discovered on the planet, called the Paracas skulls. The Peruvian archeologist discovered over 300 mysterious skulls which are believed to be at least around 3000 years old. As if the mysterious shape of the skulls wasn’t weird enough, a recent DNA analysis performed on some of the skulls presented some of the most enigmatic and incredible results that challenge everything we know about the origin and human evolutionary tree. 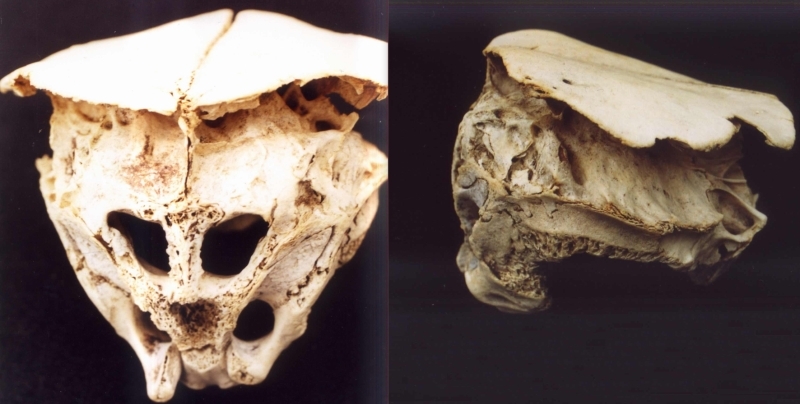 The cranium of the Paracas skulls is are least 25 % larger and up to 60% heavier than the skulls of regular human beings. Researchers firmly believe that these traits could not have been achieved through head bindings as some scientists suggest. Interestingly, the mitochondrial DNA, which is inherited from the mother, showed mutations that were unknown to any man, primate or animal found on planet Earth. The mutations present in the samples of the Paracas skulls suggest that researchers were dealing with a completely new ‘human-like being’, very different from Homo sapiens, Neanderthals or Denisovans. 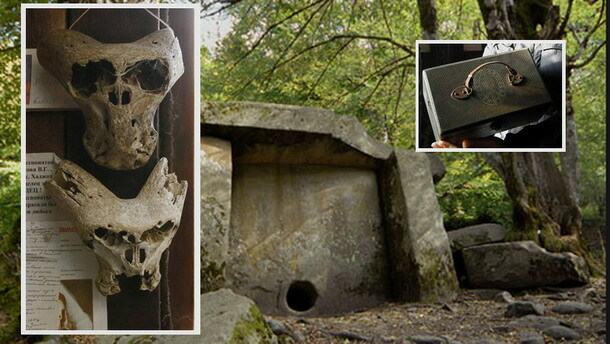 Discovered by a 38-year old resident of Plovdiv, ever since its finding, no one has been able to offer conclusive details about what the mysterious skull is. Dimiter Kovachev, the Director of the Paleontology Museum in Asenovgrad, is positive that the discovery is no fossil and has no analogy” or resemblance to any hominid skull known to science. It was in 2010 that the skull was first examined at the College of Veterinary Medicine in Denmark. The researchers concluded that they were not able to solve the mystery nor provide anything that would explain to what species it belonged to. 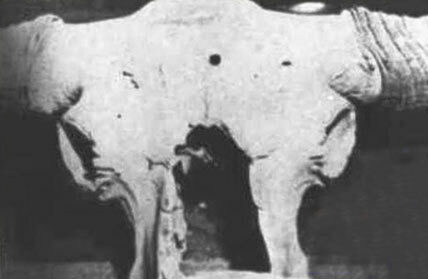 The remains of the bison that has a bullet hole in the cranium are displayed at the Museum of Paleontology in Moscow, you can see a perfectly round hole that was supposedly caused by the impact of a projectile launched at high-speed. Researchers believe, even though they never found the remains of the projectile, that the hole in the cranium was caused by a bullet caliber similar to the ones we use today. Even more strangely, this animal is native to the region of Yakuzia in Eastern Siberia and lived in the region over 30,000 years ago! So what did we miss in history? Is it possible that highly advanced civilization existed thousands of years ago? Before our “modern history”? Even when compared with the skull of a bear, it’s hard to think that you do not have in your hands the remains of an alien creature, said Melikov. Paleontologists in Moscow weren’t too excited when they received photographs of the mysterious skulls, they merely acknowledged that the skulls are unlike anything they had ever seen, suggesting that the skulls could have been submerged and exposed to sand for long periods of time, something that could have altered the shape of the skulls, but, if this were the case, how can we explain the nearly identical ‘deformations’ in both skulls which seem to follow similar patterns?